First of all, you should find a perfect position for your table that will not block access to any other functional areas of your room. Most usually, in a small kitchen, those could be a spot next to a wall, to a window, or — if we are talking about really small kitchens — in the corner. And, of course, while working with a large space, you get a lot more room for the imagination. In large rooms, you can even install casual kitchen dining sets in the middle. Once you have found a spot, it will be much easier to define the best table shape for your room. If, for example, you are looking for a corner arrangement, you should probably be looking for square or rectangular tables. If you are going to place the set next to a window, to a wall, or in the middle of the room, you can choose virtually any shape you like. 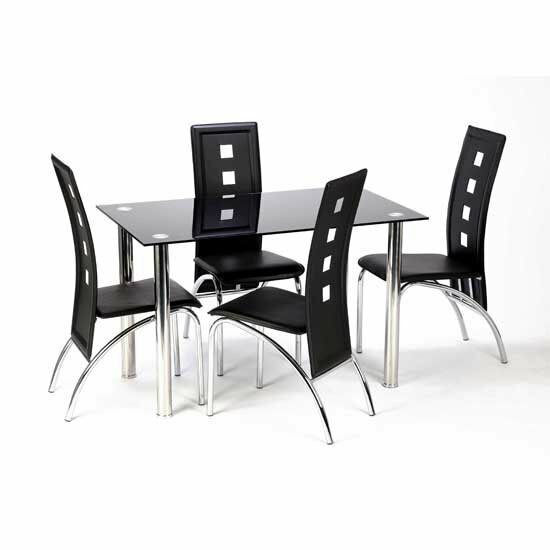 While looking for casual kitchen dining sets, it is important to avoid eye catching chair designs. For starters, they usually require more space than simple stools or chairs — and seem to occupy even more space than they actually take. Sure, in a large kitchen this will not be a problem, but still sticking to casual unobtrusive solutions is a better decision that will unlikely go wrong. This is another, equally important tip while looking for kitchen furniture — especially, if the room is small. Cooking can get pretty messy, so it is better to choose materials that are easy to clean and are resistant to moisture. Solid wood, high quality MDF, and tempered glass are usually the best examples. And, finally, do not forget that even though kitchen stands a bit separately from the rest of your rooms, it is still a part of your home. So, once you have chosen your dominant decoration style, you should stick to it. And, of course, as you are looking for casual kitchen dining sets, choose in favour of models that feature an affordable price tag and strong build. Finding a combination like that will be relatively easy if you shop with big, reputable platforms. In the UK, one of such stores could be Furniture in Fashion . This site offers an amazing product selection from trusted international manufacturers, which is why every unit listed on this website is attention worthy. Plus, you can examine each and every of them in a company showroom in Farnworth.